Never in a million years did I expect to be writing this post now. It's scary how much your life can change in a short amount of time and you don't know how you'll handle it. On Sunday 15th October, my life changed forever and I lost my beautiful, kind, loving Nonna Maria. I hadn't seen my Nonna for a while, she went away on 30th August to Italy to see her family over there and she was there until the 7th October. I said I'd go and see her during the week but because I was tired after work during the week I said I'd see her at my 21st birthday party the next weekend. Unfortunately, she didn't make it to my party as she had, what we thought was a stomach bug, and was too unwell to come so both my Nonna and Nonno stayed at home. The next morning she was taken to hospital, and we thought she was dehydrated and she'd be out probably the next day after some TLC. But about 2pm my sister rang me and said she was deteriorating and my other sister and I should try and get to the hospital as quick as we could. Within 20 minutes we were there. I went in to see her and tried to keep myself together to make sure she didn't realise that this was it. If she had to go I wanted her to have everyone she loved around her and I wanted a smile off her. She was surrounded by my Nonno, her daughters, all of her grandchildren, her sister and her niece and I really think she felt the love. I managed to crack a joke about my mum and dad with her and mention my boyfriend to her so she would have a memory of him before she went. My biggest regret is that she never got to meet him but I'm glad I got to tell her on so many occasions how happy I am with him and she said so many times she's so happy I've found somebody who treats me well. I managed to get that final smile off her and I can still picture it now. In fact I can still remember every single moment of that day. Within an hour and a half of us being there my beautiful Nonna passed away. I held her hand and kept her warm for as long as I possibly could. My life has changed so much now. Anyone who knows me knows how close I was to her and I'm so gutted that I didn't get to see her after she returned from Italy. I wanted to show her the tattoo I got whilst she was away, just so that she could tell me off and I won't ever get that moment again. Luckily for her I have a special tattoo planned in memory of her and I know she'll be looking down telling me off. Losing someone you love is the worst pain you could possibly ever feel. It's so surreal. One minute I'll be okay and the next minute I remember I'm never going to get a phone call from her out of the blue just to ask me how I am and I'll burst into tears. You start to remember every single memory you have of them like they happened yesterday and it's also amazing because these were memories I'd forgotten but they're so vivid now. When I was in primary school she would always pick me up from school and take me on the bus home, and then she'd watch me do my homework and she couldn't read or write in English but she'd watch over me and the smallest thing I did she'd always be like "VERY GOOD" and give me a big smile. 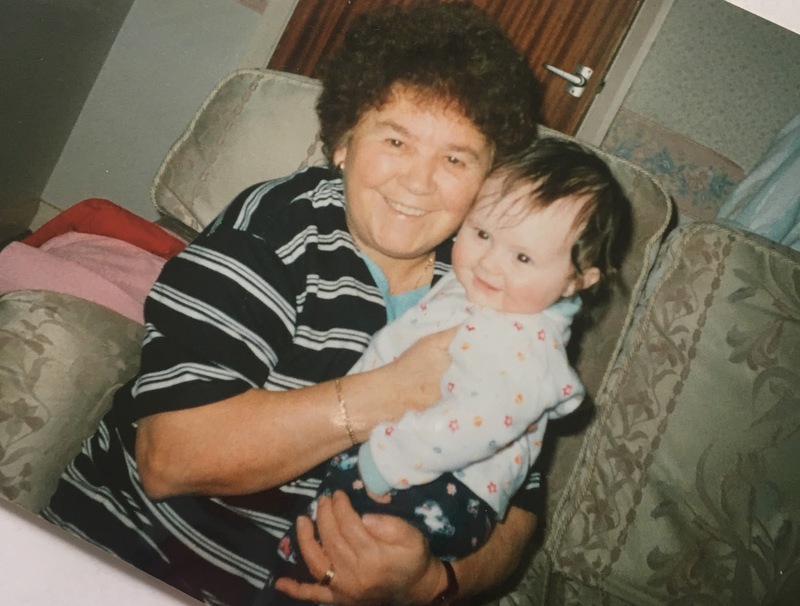 She'd always make the best bowl of pasta I'll ever eat and then we'd spend the next few hours watching Neighbours, Home and Away, Emmerdale, Eastenders and Coronation Street. At weekends when my mum and dad worked I'd spend full Saturday's with my Nonna. We'd go to Bury market, we'd always go and see her Italian friends and family and she'd always seem so proud of me. We would gossip so much about people who lived on her street and now I've come to realise now where I've got it from - it's her! She'd take me to church and I secretly enjoyed singing the hymns and sometimes we'd go and buy some carnations from Asda and go to the cemetery and put flowers on people's graves that looked like they could do with some love. I remember being 9 and being dumped by my boyfriend of probably 2 weeks and I told my Nonna and I remember the advice she gave to me when I was nine was "you don't want a boyfriend, you want a job" and she continued to give me that advice right up until last year and it makes me laugh every time I think of it. She had some of the best stories. She had so many to tell me from World War 2 and of how she met my Nonno and from when my mum was little. One of my favourite things about my Nonna was she always wanted to see my achievements and she was always proud of me. She would come to all of my Christmas plays at school even when I only had a little part. She went to see me sing in Young Voices at Manchester Arena and said I was amazing even though I was singing with a hundreds of other kids so she probably didn't actually realise I sounded terrible. She came to wave me off when I was going to prom and I'm so happy she did. Every time I got a new job, she thought it was amazing. I spoke to her about my blog and although she literally had no idea what a blog was and she never read it, she would always listen to me and say it was really good. I have struggled so much with coming to terms with her no longer being here. Her funeral was the most moving day of my life. The music chosen were the most perfect choices. After she passed away my granddad gave me my birthday card. They hadn't written out my birthday card for years because they'd usually forget and my mum would write it but this year they wrote it and I was surprised with the words. They wrote "All our love forever" and I was given £100 as my gift, and my granddad said it was all her idea. It's as if she knew. She wanted me to use the money to get some jewellery, so I used it to buy another charm for the bracelet they'd got me for my 18th birthday. I chose to get the 'Forever in my heart' charm and get it engraved so I'd always have that symbolisation of her, and I absolutely love it. I wanted to write this post so I had a memory of her on my blog. So I could put some sort of closure to it all. I will honestly treasure her for the rest of my life and I hope I continue to make her proud.